Just ordered the new Koch disc to replace my old SPO one. It kind of pained me to do so actually as am still very fond of my old original Japanese disc. In any case, I'm really looking forward to the remastered anamorphic image and all the extra features with Mike Siegel's subs. Yeah, that last one-sheet is very Kirby-esque! 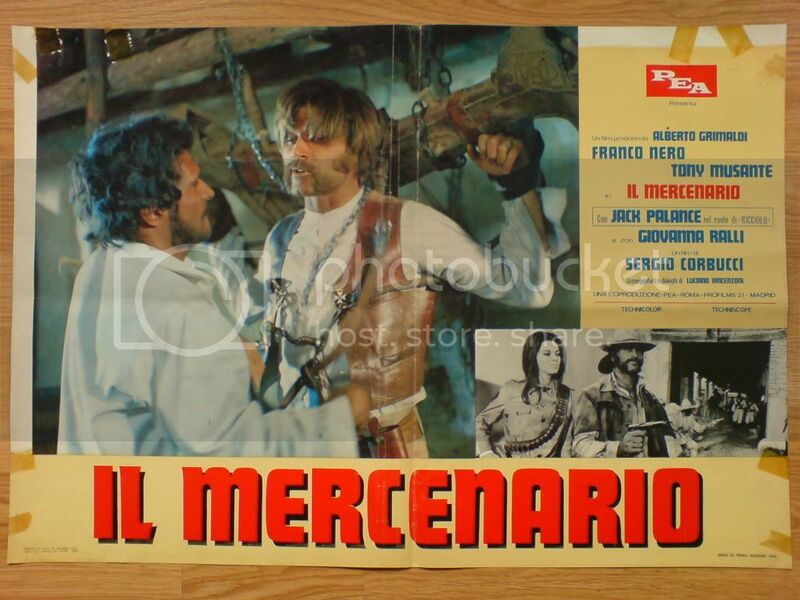 Watched Il Mercenario the other day I haven't seen it for a couple of years and was all over again impressed with Corbucci's accomplishment. Its the Corbucci equivalent of GBU. This go round I payed more attention to the the Columba and Curly characters and to the action sequences. Reassessing Columba (Giovanna Ralli), she is practically the 4th main character and a catalyst to much of the Paco-Polack rivalry, she could have used a bit more screen time. Palance's Curly is sort of a foppish border town gangster, owner of a gambling hall, surrounded by equally foppish henchmen, his over-reaction to Sebastian's death hints of gay overtones. Corbucci really excels in his action sequences, all in all its very entertaining "Zapata". A few thoughts: (and I should mention that I didn't have time to read all 7 pages on this thread before posting this, so my apologies if I am repeating anything that has already been discussed here). But they sure were funny as hell! I thoroughly enjoyed this film, from the first minute to the last. Not a moment was wasted! -- I absolutely could not stand Nero's voice. I understand (thanks to cj ) that he dubbed his own voice in English. Well it was terrible. He basically spoke in a monotone at all times. Generally, IMO the actor's real voice should be used whenever possible. But in this case, while Nero obviously knew English, it's clear that he could not speak it in the same tone as one would ordinarily speak, ie. he could only read it in a monotone. I have never heard him speaking Italian, but I'd guess that he did not speak Italian in the same monotone. And I am not sure whether his character was supposed to be actually Polish, or an American of Polish descent. But either way, his was accent was in no way Polish or American. Not sure how a Polish or Polish/American man would develop a Mediterranean accent So they probably should have used a different person to dub his voice, just as Leone used some other woman to dub Cardinale's voice in OUATITW, even though Claudia did know English. Glad you liked it. One of the 5 best SWs for me. Nero's Italian voice was dubbed by someone else, and is very different from his original voice. The German version used a voice similar to the Italian one, and I think both sound indeed much better than Nero's own voice. For me his English was acceptable I just took it as a generic European Accent. I never heard of a "generic European accent"
88 Films brings this to Blu at the end of January 2017. Well I took a gamble and ordered in both this and Companeros from Germany. Having just watched The Mercenary it's already money well spent, I frickin loved it. You play by the rules you lose! 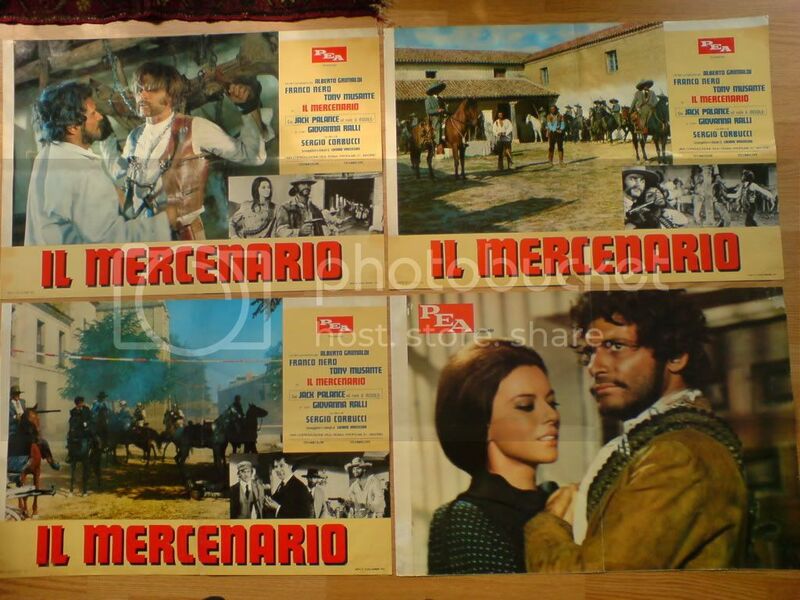 Il mercenario (The Mercenary) is directed by Sergio Corbucci and Corbucci co-writes the screenplay with Luciano Vincenzoni, Sergio Spina and Adriano Bolzoni. It stars Franco Nero, Tony Musante, Jacl Palance and Giovanna Ralli. Music is by Ennio Morricone and Bruno Nicolai, with cinematography by Alejandro Ulloa. A Technicolor/Techniscope production, Corbucci's Zapata Western is a barnstormer full of political bents, wry humour and searing action. With beautiful Spanish vistas prominent and a musical score that's like a spicy jumping bean, story holds court from beginning to end. Essentially at it's heart it's a buddy buddy piece, though these buddies are hardly what you would call rock solid. 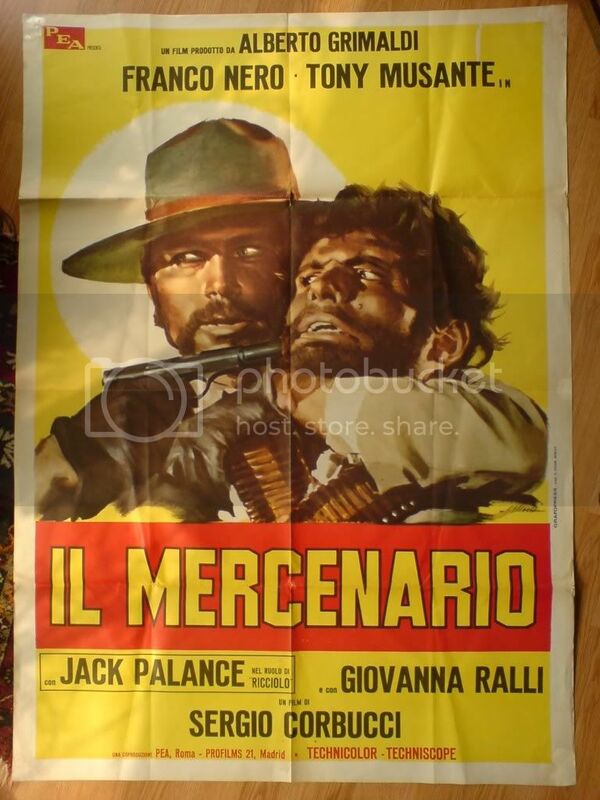 Into the mix comes the gorgeous Ralli to add the sauce, whilst as Paco and Kowalski take on the Government and its Army, they also have to contend with Curly (Palance), a camp sadistic dandy with revenge on his mind. Corbucci has a great eye for action, there's reams of gun fire, with machine guns, artillery and even a plane laying waste to bone and buildings, and usually the cruelty and carnage on show is done with a glint in the eye (milk and dice drink/grenade in mouth), and splendidly so. It's so deft that often a scene is being played out and on the side there is an execution going on, casually unfurled as matter of fact. There's also religious fervour cheekily in place, with Paco's army the Apostles and Polack their Jesus, so it's no surprise that religious imagery is placed within. Corbucci also likes to let his camera talk. Standard Pasta Western traits operate, such as close ups of the eyes, roving tracking shots, angled up tilts and glides. He also gets lucky with the weather for one shot, capturing a natural rainbow amid some more furious character action. Cast are doing sterling work. Nero is cool supreme, with awesome face fuzz and casually striking matches on various things, Nero proves to be a fine action hero and it's so easy to buy into his character. Musante is also excellent, giving Paco an earnestness that's beguiling, he's a lovable rogue, at times bumbling but utterly heroic within the revolutionary arc. While Palance, though not in it as much as you would think, is giving Curly a most intriguing persona, confusing sexuality and religious alibi. I have no idea why of all people Cox made an audio commentary for Il medrceanrio. He does not like the film, actually I think he does not even understand Il mercenario. And the least thing this highly underrated film needs are comments by an anti-connoisseur.